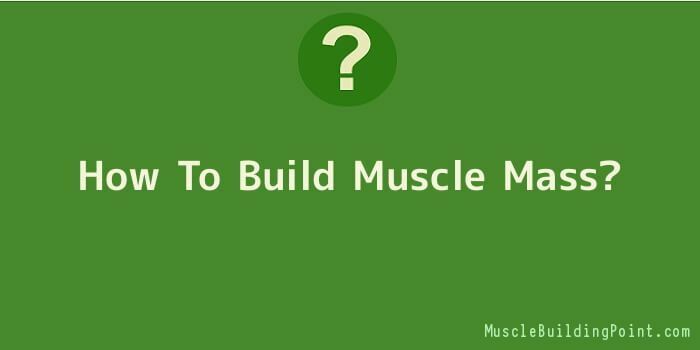 Men who want to learn how to build muscle mass, all make the same error. They try to use the same workout routines as professionals are doing, or people who have been bodybuilding for an extended period of time. These routines do not work for the everyday Joe who is looking to build muscle. In one sense, there is no one-size-fits-all approach. Rather, there are small variations depending on who you are. However, for the beginning bodybuilder, or for the bodybuilder who was trying hard to gain muscle not succeeding, here are some tips that follow to achieve success. When the first steps to successfully gaining muscle mass is to first become stronger. Remember, men with bigger muscles are not necessarily stronger than men with smaller muscles. Strength training is completely different than training to gain mass. However, in the beginning it’s not a bad idea to first focus on strength training. This will bring your muscles from their state of inactivity in two estates of strength and activity. One mistake that many men make is to start right away and using lots of weight in their training. This is another huge mistake. In order to gain muscle mass the fastest and safest way is to be sure to use proper form. The best way to learn proper form is with empty bars with no weight on them. Set an appointment with a trainer at your health club and have him or her show you the proper form for all of the weight lifting exercises that you are going to want to use in your strength and mass building routines. Practice everything that they say until they become second nature to you. Then, you can start adding weight Little by little. Only this way can you reach the greatest amount of success. There is some disagreement, depending on who you ask, on which is better, free weights or weight machines. There are several benefits to using free weights over machines. First of all, once you have been properly trained with a trainer at a gym, you can then cancel your membership and do all your weightlifting at home. A full weights set with bags is not that expensive. You can fit everything you need easily into an empty room in your house. With free weights you are virtually unlimited with a number of exercises that you can do. You are very limited with weight machines. Most of those big and clunky machines only allow you to do one or two exercises. You can do an endless number of exercises with a simple set of dumbbells. Bodybuilding is not just isolating a certain muscle and exercising on its own. Gaining mass also involves developing balance and developing the muscles that assist the main muscle. This is best done with free weights. When lifting free weights, you also simultaneously controlling proper form and maintaining the balance. Again, don’t try and keep up a routine as a beginner that someone who has been weightlifting for a long time users. You will burn out quickly and likely even get an injury if you work out too much. In the beginning you must workouts for three days per week. Give your muscles at least one day of rest in between each workout. Have a longer rest on the weekend. Drink lots of water. Eat a very healthy diet. Your muscles are good and need every little bit of protein they can get to grow. You don’t want to waste opportunity by filling yourself with useless calories.